Freeze dried food - if you're into carrying light, this is for you. These are almost the same size as the regular meals, just more like something people tend eat for breakfast and generally contain more carbs and energy to get the day going. Freeze dried food is good when potable water is available so that you don't have to carry it, like when trekking in Finland. 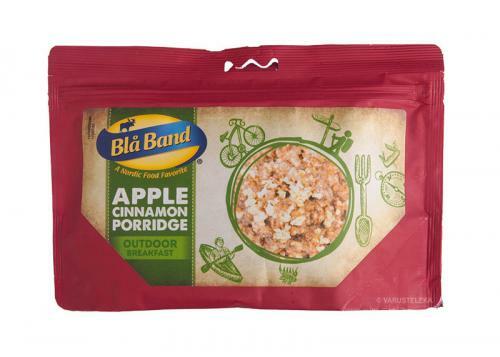 Blå Band stuff has the usual modern features - it doesn't require cooking after adding water, and you can eat it straight out of the bag. Despite the Swedish name, the food itself is actually made in Germany. The food has a shelf life usually for two years. These won't turn bad after that, though. Tear off the top of the pouch where marked and pull out to make a bottom. Add boiling water up to the marking (about 3,5 dl) and stir. You can also use cold water. Fold down the edge of the pouch and seal with included tape. Let rest for about 10 min, or 30 min if you use cold water. Note! This flavour was some army contract lot, which was cancelled but not before the stuff was made. That's why the cheap price! One-off lot! Sugar, modified potato starch, fruit [6,0%] (pineapple, passion fruit, mango), maltodextrin, glucose syrup, acid (citric acid), antioxidant (ascorbic acid), flavouring. Rye flakes [57%], palm fat, apple [13%], cream powder, sugar, maltodextrin, salt, cinnamon. The following ones are discontinued. Rice [68%], palm fat, cream powder, strawberries [6,0%], sugar, maltodextrin, salt, flavouring. Sugar, modified potato starch, blueberry [2,4%], maltodextrin, acid (malic acid), elderberry, raspberry [0,5%], antioxidant (ascorbic acid), flavouring. Flakes [44%] (oats, wheat, rye), sugar, fruit [9,4%] (mango, pineapple, passion fruit), palm fat, glucose syrup, modified potato starch, maltodextrin.